Looks Good from the Back: Adrien: That Fine Line. This is a pretty typical Saturday running-around-with-Kate outfit. 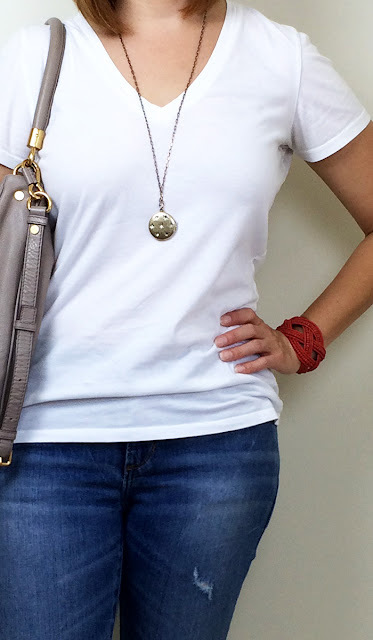 I am pretty minimal here and originally wasn't wearing the bracelet but there's a fine line between minimal and suuuuper boring so I thought a little something more was needed. My jeans are (surprise!) 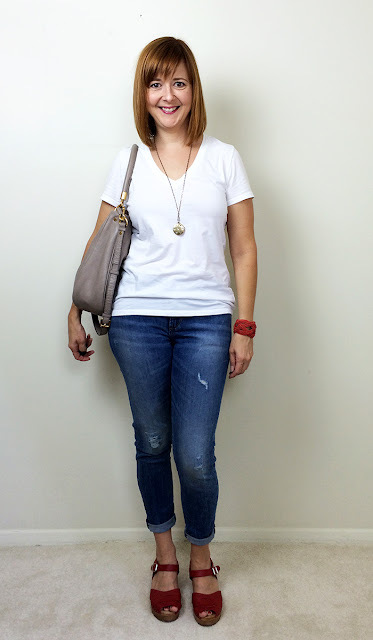 the Banana Republic Distressed Skinny Ankle jean that I love so much. I was happy to see that they have this style in some other washes. I especially love the gray! I'm also wearing my favorite Everlane Cotton V t-shirt. I have two in white and they're just perfect plain tees. Nothing fancy, just right and only $15. My necklace is my old faithful J.Crew locket that I have worn to death. I'm always looking for it's eventual replacement. I wish I could afford something like this! Ha, never gonna happen. Marianne has this House of Harlow locket which I love but I don't want to be a copycat. My bracelet is a woven seed bead cuff my sister gave me a few years back and I love how cheerful it is. I can't find one exactly like it, but there are a bunch on Etsy. There's just something easy and casual about a pretty beaded cuff. This is pre-bracelet when Daniel decided to pay me a visit and step on my toes. 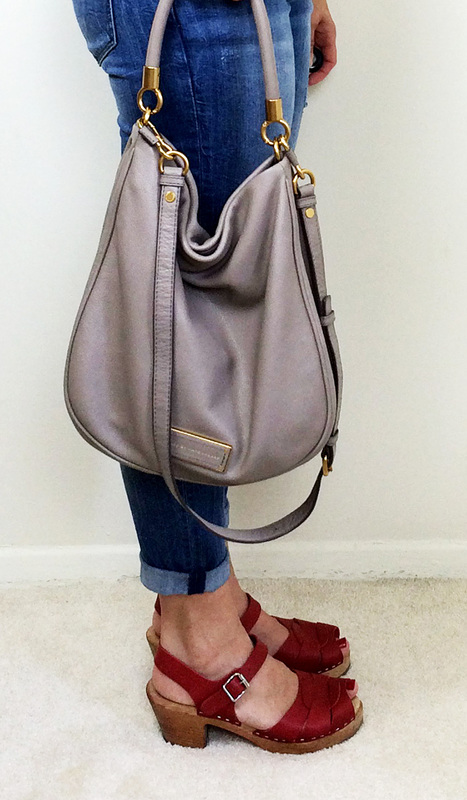 My usual summer bag 'n shoes that I'm sure you're all tired of seeing: MBMJ Too Hot To Handle hobo and Lotta From Stockholm peep toe clog sandals. As per usual, my pics are a bit dark and those sandals are really a lovely bright red. Just saying. Looks perfect for a Saturday! I have a question about the sandals - mine are newer and the heels are still light. What do you do to take care of them? Mine have some marks on them. Do I leave them alone or treat the wood? The wood on mine is dark because I rub them with oil. I'd read that if if the untreated wood gets wet it can mold (!) so you can treat it with oil to seal it. I used olive oil but I think mineral oil would work just as well.